Building on Latin - Grammar 4, this course continues basic instruction in Latin. Students will continue learning vocabulary, grammar, pronunciation and translation. 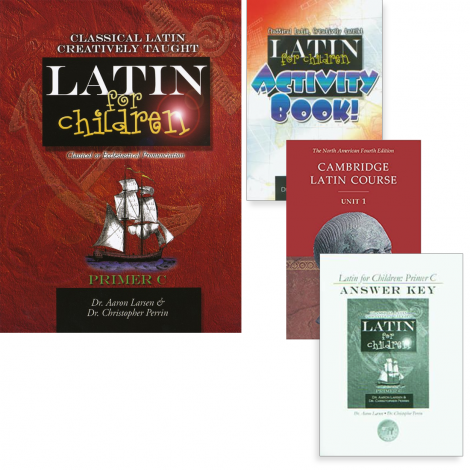 Students will learn new vocabulary each week, to conjugate verbs and expand their learning of Latin grammar. Teaching will use a variety of means including worksheets, games, chanting, tests, and oral and written translation work. Recommended for grades 5 - 6. Homework will average 2 - 3 hours per week. Latin - Grammar 5 is taught by an expert instructor in the Veritas Virtual Classroom and is limited to only 20 students per course. Minimum age of 9 and maximum age of 13 on the first day of class. Successful completion of VSA Latin - Grammar 4 or comparable course in the previous 24 months is strongly encouraged. Latin - Grammar 5 Course Kit (003518) The Course Kit contains all of the items below at a discounted rate.